Catherine McAuley College is well-served by the urban and country bus networks. 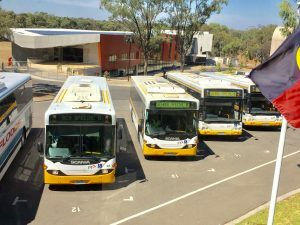 Students who reside in areas serviced by the School Bus Management System, including some areas of Strathfieldsaye, are eligible for country bus travel. The School Bus Management System has been introduced with the view to streamlining and improving the school bus application process for parents, students, schools and bus operators. The changes will mean that the eligibility assessment, application processing and fare collection (where required) currently undertaken by Bendigo South East College will be centralised and looked after by PTV to support these improvements. Travel on the country bus network is free to eligible travellers. Coolock (Junortoun) is well serviced by a network of buses from all areas of Bendigo. Please refer to the current timetable to check for the best option for your student. Travel on these buses is paid by using tap on tap off MYKI or by purchasing a yearly student bus pass. Complete the form and affix two passport sized photos (grade 6 school photos are acceptable). Attend the General Office at Coolock or St Mary’s to have the form signed by College staff, then attend Bendigo Station to purchase the card and MYKI bus pass. Travellers who reside more than 4.8kms from the College may be eligible for Conveyance Allowance. This allowance is only available to those travellers who have purchased a bus pass. To claim the allowance please see form below. This form is to be completed and returned, along with the receipt for the bus pass, and returned to the Finance Office, St Mary’s, Barkly Street, Bendigo. Castlemaine and district travellers are able to access the Castlemaine direct service. Please contact Mrs Audra Petri for further information. The 2019 Timetable is now available. It is helpful for students if they know the bus bay before they wish to commence using the bus.